Nearly all pet aquatics companies manufacture a product that removes chlorine. 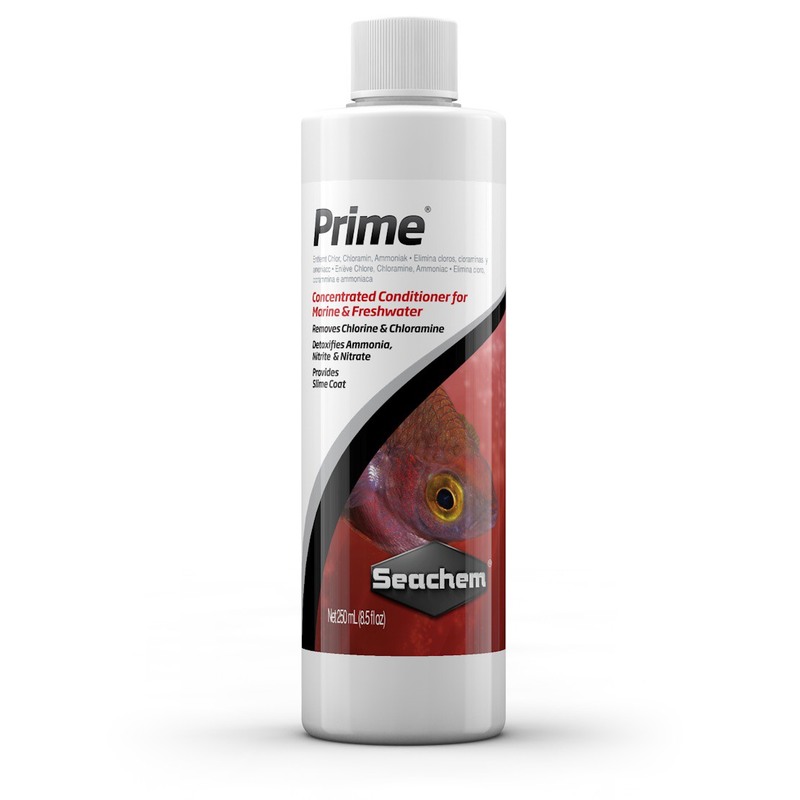 None of those, however, can compare in quality, concentration, or effectiveness to Seachem’s flagship product: Prime®. Prime® is the complete and concentrated conditioner for both fresh and saltwater. Prime® removes chlorine, chloramine and detoxifies ammonia, nitrite, and nitrate. It is non-acidic and will not impact pH. A further bonus for the reef hobbyist—Prime® will not over-activate skimmers. Prime® may be used during tank cycling to alleviate ammonia/nitrite toxicity. It contains a binder which renders ammonia, nitrite, and nitrate non-toxic, allowing the biofilter to more efficiently remove them. It will also detoxify any heavy metals found in the tap water at typical concentration levels. Use at start-up and whenever adding or replacing water. When transporting or quarantining fish, use Seachem StressGuard™. When adding new fish, use Stability®. Both are ideal for use with Prime®. I think that my Prime® might be old because it smells like it went bad. A: Prime® has a very distinct odor that is similar to sulfur which is completely normal. I noticed some small black specks in the bottom of my bottle of Prime®. Is it still good? A: The presence of small black specks occasionally occurs and is normal. I am using Prime® to control ammonia but my test kit says it is not doing anything, in fact it looks like it added ammonia! What is going on? A: A Nessler based kit will not read ammonia properly if you are using Prime®... it will look "off scale", sort of a muddy brown (incidentally a Nessler kit will not work with any other products similar to Prime®). A salicylate based kit can be used, but with caution. Under the conditions of a salicylate kit the ammonia-Prime® complex will be broken down eventually giving a false reading of ammonia (same as with other products like Prime®), so the key with a salicylate kit is to take the reading right away. However, the best solution ;-) is to use our MultiTest™ Ammonia kit; it uses a gas exchange sensor system which is not affected by the presence of Prime® or other similar products. It also has the added advantage that it can detect the more dangerous free ammonia and distinguish it from total ammonia (total ammonia is both free ammonia and non-toxic ionized forms of ammonia). I tested my tap water after using Prime® and came up with an ammonia reading. Is this because of chloramine? Could you explain how this works in removing chloramine? A: Prime® works by removing chlorine from the water and then binds with ammonia until it can be consumed by your biological filtration (chloramine minus chlorine = ammonia). The bond is not reversible and ammonia is still available for your bacteria to consume. Prime® will not halt your cycling process. I am going to assume that you were using a liquid based reagent test kit (Nessler based, silica). Any type of reducing agent or ammonia binder (dechlorinators, etc) will give you a false positive. You can avoid this by using our MultiTest™ Ammonia kit (not affected by reducing agents) or you can wait to test, Prime® dissipates from your system within 24 hours. How does Prime® make a difference in reducing nitrates? A: The detoxification of nitrite and nitrate by Prime® (when used at elevated levels) is not well understood from a mechanistic standpoint. The most likely explanation is that the nitrite and nitrate is removed in a manner similar to the way ammonia is removed; i.e. it is bound and held in a inert state until such time that bacteria in the biological filter are able to take a hold of it, break it apart and use it. Two other possible scenarios are reduction to nitrogen (N2) gas or conversion into a benign organic nitrogen compound. I wish we had some more "concrete" explanation, but the end result is the same, it does actually detoxify nitrite and nitrate. This was unexpected chemically and thus initially we were not even aware of this, however we received numerous reports from customers stating that when they overdosed with Prime® they were able to reduce or eliminate the high death rates they experienced when their nitrite and nitrate levels were high. We have received enough reports to date to ensure that this is no fluke and is in fact a verifiable function of the product. How often can I dose Prime®? A: Prime® can be dosed every 24-48 hours. If Prime® is removing ammonia from the system, won’t that starve the beneficial bacteria? A: Prime® does not remove ammonia, nitrite, or nitrate from the system. It simply binds with those compounds making them harmless to the inhabitants and still bioavailable to the beneficial bacteria. How long does Prime® stay bound to the ammonia, nitrite, and nitrates? A: Prime® will bind up those compounds for up to 48 hours. If they are still present after that time frame, they are released back into the water, unless Prime® is re-dosed accordingly. Also, if your ammonia or nitrite levels are increasing within a 24-hour period, Prime® can be re-dosed every 24 hours. When should I use the emergency dose of 5 x the recommended amount of Prime®? A: No, as long as Prime® has been stored properly, it will last indefinitely. My Prime® smells like garlic. Is this normal? A: Prime® can vary in smell based on the parameters in the warehouse during the time of manufacture. It does normally smell of Sulfur, but we have extensively tested the product and found that the difference in scent does not in any way effect how the product functions. It is still perfectly safe to use!